Awareness is is the key to beating glaucoma. A recent study has shown that Canadians are not doing enough to protect themselves (by getting regular eye exams) and that glaucoma rates are rising in Canada. This shows just how important glaucoma awareness is. 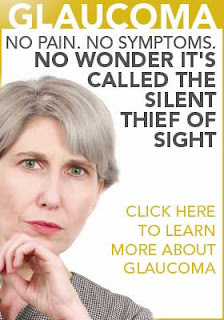 Glaucoma is called the silent thief of sight because by the time one realizes they have it, it is already too late to reverse vision loss. Glaucoma is a complicated disease that damages the optic nerve, leading to progressive, irreversible vision loss. It is a leading cause of blindness. When glaucoma damages your optic nerve, you begin to lose patches of vision, usually starting with your side vision (peripheral vision). Over time, glaucoma may also damage central vision. Many people do not notice a loss of side vision until they have permanently lost a great deal of vision. That is why it is so important to get annual eye exams that can diagnose glaucoma before it is too late. Those who have risk factors for glaucoma may need more frequent eye exams (talk to your eye doctor if you are unsure about how often to have an exam). When checking for glaucoma, eye doctors usually look for damage to the optic nerve and any loss of side vision. They may also check your eye pressure because high pressure in the eye can damage the optic nerve. Once glaucoma takes your vision, you will never get it back. Early detection is the best way to retain your sight. There are several different types of glaucoma, with the most common being open angle glaucoma. Other relatively common types of glaucoma include normal tension glaucoma, acute (angle closure) glaucoma, secondary glaucoma, and post-surgical glaucoma. Open angle glaucoma results when fluid drains too slowly from the optic nerve area and pressure inside the eye builds up. The high pressure inside the eye damages the optic nerve such that the nerve can no longer send signals to the brain. In the early stages of the disease, this is experienced as patches of blurred or smudged vision. Normal tension glaucoma, also called low-tension or normal-pressure glaucoma, is characterized by optic nerve damaged even though the pressure in the eye is not very high. The cause of this type of glaucoma is still a mystery. People with a family history of normal-tension glaucoma are at higher risk, as are people of Japanese ancestry and people with a history of systemic heart disease such as irregular heart rhythm. Acute (angle closure) glaucoma is characterized by a sudden rise in pressure inside the eye. Emergency medical attention is required if this happens. The signs associated with acute glaucoma include blurred vision, severe headaches, eye pain, nausea, vomiting or seeing rainbow-like halos around lights. Occasionally, the condition may be without symptoms. Acute glaucoma occurs in less than 10 percent of Caucasians or African-Americans, but for those of Asian and Native American descent the risks are higher. Secondary glaucoma results from certain diseases and conditions that damage the eye's drainage system such as diabetes, leukemia, sickle-cell anemia, some forms of arthritis, cataracts, eye injuries or inflammation of the eye, the use of drugs that contain steroids and growth of unhealthy blood vessels. Ten percent of all glaucoma cases are secondary glaucoma. Post-surgical glaucoma is a result of surgery. Specific eye surgeries, such as retinal reattachments, increase the chance of getting glaucoma. Make sure your eye doctor discusses the risks of any proposed eye surgery, including the risk of developing glaucoma. If you click on the picture accompanying this post (or just click here) you will be directed to a handy PDF flyer that you can print or email and share with family, friends and co-workers. Help raise awareness of glaucoma during Glaucoma Awareness Month! The BC Doctors of Optometry Blog recently did a post on glaucoma. Read it here.